Galena Callisto Seafoam from Firespiral Slings is 25% Merino lambswool, and 75% cotton. It’s 260 GSM making it a medium weight wrap. Galena is woven using Firespiral's Alchemy Weave which is slightly looser and makes for lovely soft & mouldable wraps. Firespiral is one of the biggest wrap brands in the UK, with a reputation for producing super soft wraps that are easy to use and suitable from birth to toddlerhood and beyond. 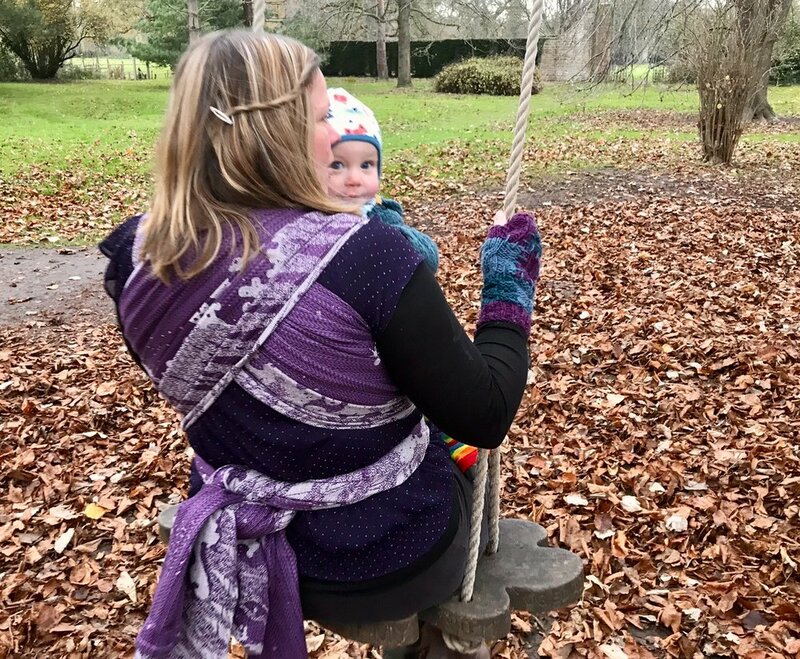 Founded by two babywearing mothers, they design their own jacquard woven wraps in-house, inspired by nature, science and their own imaginations. Firespiral use small, local producers and suppliers of quality yarns and have a strong focus on ecological and ethical production. Firespiral offer free shipping to the UK, and international shipping is just £8 per order. Each wrap comes with a tote bag and pin badge, along with instructions for safe use. A quick Google tells me that Galena is the natural mineral form of lead and an important source of silver, which explains the choice of name for this pretty, light silvery weft. If you didn’t have them next to each other, you could be forgiven for thinking that the Galena Callisto colourway is similar to the Calluna Callisto colourway used for the Birch Trees I reviewed recently. Of course, they share that stunning variegated rich purple Callisto warp, but the woolly Galena weft is a silvery white compared to Calluna’s heather pink. This makes for a cooler colourway that looks stunning on the Seafoam design. The pale silver contrasts clearly with the deep purple and shows off all those beautiful little details in the pattern. I’ve had the pleasure of owning and reviewing a number of Firespiral’s Seafoam design wraps and it continues to be one of my favourites. It captures the natural life and movement of the ocean perfectly and is a natural choice for thalassophiles everywhere! As a family of four water signs - a full quota of Pisces, Cancer & Scorpio no less - we have to make regular pilgrimages to the sea and it’s no surprise at all that the first Firespiral I ever bought was a Seafoam. The design undulates and sloshes all around you, with no concerns about placement, although it’s always nice when a swirl, spiral or sea creature floats its way into a prominent position. The reverse side of the wrap shows the design with mirrored colours and you can wear it whichever way to choose. In hand, the silky smooth cotton Callisto warp contrasts with the slightly rougher, textured Merino wool warp. Galena feels soft, snuggly and floppy from the outset. While there’s no mistaking the woolly texture in the silvery parts of the design, the wool content is low enough for the smooth soft texture of the cotton to have a big influence on the overall feel of the wrap. If I was forced to choose a favourite blend, 25% Merino, 75% cotton may well be it, especially in the cooler seasons. In many respects it’s the best of both worlds, the perfect balance of cushy, woolly bounce and the floppy softness of cotton. You may not have quite as much toddler-worthy blankety support as a thick 50% Merino like Calluna Callisto, but you gain a wrap that’s softer, cooler and more mouldable. In a medium weight like Galena, in Firespiral’s Alchemy weave, you get a wrap that’s suitable from birth to toddlerhood, and that’s accessible for even a novice wrapper. Excitingly, the Galena Merino is the same weight and from the same supplier as Firespiral’s legendary Albus weft. Sadly, I’ve never got my hands on an Albus so I can’t compare them directly, but there is indeed an extra special soft, fine, snuggly quality to Galena that makes it a little different from other Firespiral woollies I’ve tried. If you’ve tried woollen wraps from other brands and found them itchy or scratchy, a wrap like Galena may well convert you. My skin has been irritated by woollies from other brands but I can honestly say that I can detect no ‘wool itch’ at all from Galena. It’s just a lovely comfortable, soft, cuddly wrapping experience. Galena wraps true to size. Its medium weight means that it’s sufficiently thin and mouldable for a newborn, while still being eminently toddler worthy. Galena is cushy and comfortable on the shoulders without being bulky, and is still mouldable and easy to tie, making a neat knot. Galena can be washed in the machine on the wool cycle with a low spin. The first wrap that my eldest son took an active interest in, and still requests over all others, was the 25% Merino blend Nightfall Frost Midwinter from Firespiral. He likes to snuggle up with it even when we’re not wrapping and I’m certain that its feel, and the comfort of being carried in it, are the main reasons for his preference. He still asks to go up in it at night when he’s having trouble getting to sleep and it’s like a soft, cushy hug for both of us. If you’re familiar with Nightfall Frost Midwinter, Galena is similar in terms of its wrapping qualities, but with some distinct improvements. The cotton Callisto warp is definitely softer, smoother and chunkier, and the Galena wool seems extra snuggly and soft somehow. Given that we considered Nightfall Frost pretty darn perfect, Galena is, well, awesome. Galena Callisto hits the sweet spot in the balance between woolly cushiness and soft, mouldable, easy care cotton. 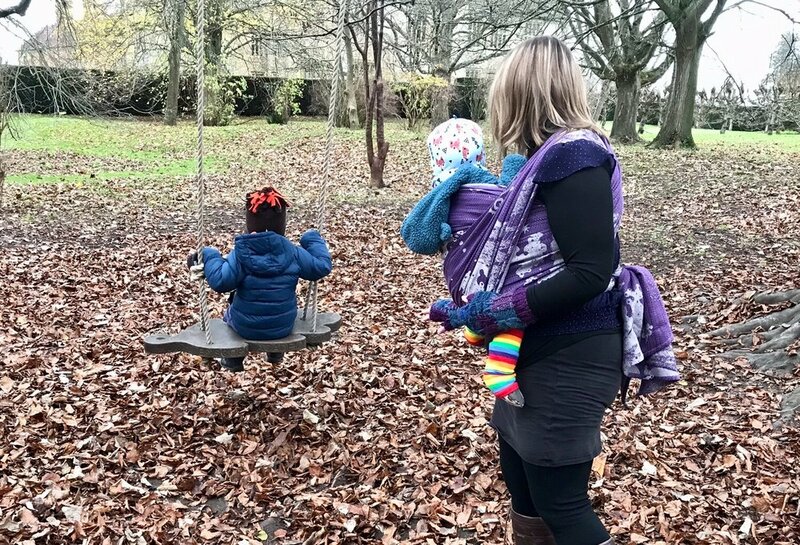 It’s great for toddlers and tiny babies alike and is exactly the kind of wrap you’ll hold onto throughout your wrapping years and on to forever. If you’re a bit iffy about wool sensitivity, but tempted to try, you’ll struggle to find a softer, more delicate skin-friendly woolly than Galena. Galena will be released on 8th January and available to buy from the Firespiral Slings website. I recommend following them on Facebook for all their news and details of upcoming releases.